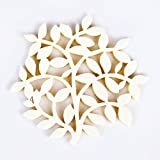 4 Pieces White Tree Felt Coasters Excellent Absorbent Perfect Home &amp; Kitchen Decoration 100% Satisfaction Guarantee! I initially acquired a set of the white tree coasters to use during the vacations and the winter. I found them to be extremely festive. By the time spring came, I had actually fallen in love with these coasters. They were extremely durable-- not taking any wear from the unlimited mugs and cups with the long winter season. Likewise, they did a rather impressive task of taking in wetness considering that they have holes in them. To be noted too is that they didn't scratch a single table of mine. But sadly, the winter was up and I had to transition to a new set of coasters for spring and summer season. I searched Amazon, eventually finding my way back to this page. To my joy, green tree coasters were offered too (I either hadn't observed this initially or had actually forgotten). I acquired the green coasters quickly and anxiously awaited for their arrival. Upon delivery, I was delighted (but not surprised) to see that the quality of the green coasters was simply the very same as the white coasters. I traded my white tree coasters for green around my house, packing up the white coasters for storage. As the trees and flowers grew and came to life outdoors, I had beautiful green foliage-style coasters to match. These are the best coasters that I have actually acquired since yet and I quickly prepare to buy the grey tree set too for additional range. I highly recommend them to anybody looking for a functional yet classy coaster. - Loved to have some adorable coasters that fit your dining-room / tableware? - Wished to make your home appear even more sophisticated at an inexpensive price? - Sick of having coasters adhering to the bottoms of your glasses? - Fed up when coasters left marks or stain on your wooden surface after hot / cold drink sitting on them? - Got upset when the condensation fluid dripping all over you when you pick up your drink? - Irritated since your coasters are too small for your cup?